Hotel Mansingh Palace Ajmer, Mansingh Palace Hotel Ajmer, Reservation for Hotel Mansingh Palace, Ajmer, India. Address: Vaishali Nagar, Ajmer, Rajasthan -305001, India. Accessibility: 136 kms. from Airport, 3 kms. from Railway Station, 3 kms. from Bus Stand. Hotel Mansingh Palace is located in the heart of Ajmer - A city with a harmonious blend of Hinduism and Islam, run by the Mansingh group of hotels, built in fortress style. 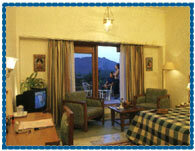 It is a fine hotel offering immaculate hospitality and impeccable service. 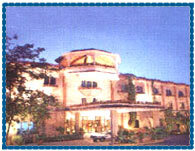 Hotel offers good facilities for business meetings and banquets. Hotel offers 60 well furnished, centrally air-conditioned rooms including "Family suites" designed in 18th century fortress style. All the rooms have attached baths with running hot and cold water, hair dryers, minibars and tea-coffee making facilities. Laundry and Dry-cleaning Service, Parking, Doctor on Call, 24 Hour Money Exchange, Mini Bar, Direct Dial Telephones, Beauty Parlour, Health Club CTV, Scretarial Services and Fax Services, 24 Hour Room Service, Sheesh Mahal - Multi Cuisine Restaurant, Sipeh Salar Bar, Shopping Arcade, Personalized Stationary, Hostess or Receptionist, Extra Telephone or Fax line, Folk Dance & Fireworks, Theme Dinner.